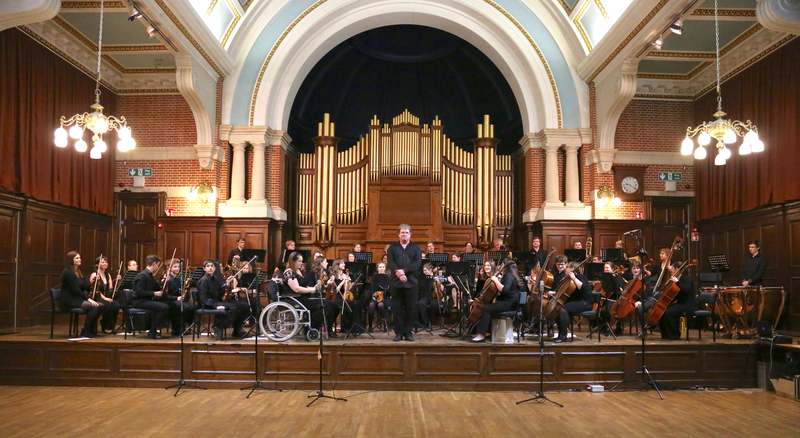 To celebrate 10 years with our conductor Paul Cox, Reading Youth Orchestra held a celebratory concert in the University of Reading’s Great Hall. Joining us to play Grieg’s Piano Concerto in A Minor was RYO alumnus Simon Crawford-Phillips, and also in the programme was Rossini’s Tancredi Overture and Beethoven’s 5th Symphony. The concert was raising money for the League of Friends of the Royal Berkshire Hospital. Reading youth orchestrate a dramatic spellbinding evening. When I heard that international pianist Simon Crawford-Phillips was to revisit his roots in the Reading area for his first returning concert with Reading Youth Orchestra after a twenty-five year absence, I could not buy a ticket fast enough. As a fellow former member of RYO myself, I was intrigued by a program weighing heavies of the orchestral repertoire – Grieg Piano concerto and Beethoven 5th symphony – against a lighter operatic overture – that of Rossini’s Tancredi. Tackling well-known works is never an easy task, and the Beethoven is probably one of the most famous. Conductor Paul Cox certainly threw himself into the task and the orchestra responded with the sort of style and dignity that reflected with a sparkle on the ten year anniversary of Cox’s involvement with the young players of RYO. Despite Tancredi being a tragic opera, the overture was a triumphant joyous opening for the amateur young musicians. A definite warmth in the strings and secure playing in the wind section reassured the audience that we were in for a treat of an evening. After this lively introduction, Crawford-Phillips took to the stage. The dramatic opening bars of the Grieg had every member of the audience on the edge of their seats. Simon showed off the sensitive communication and melodic expression which he has developed so expansively in his career. Despite only two rehearsals as a complete ensemble, the communication between orchestra and pianist in the lively first movement literally drew gasps from the audience as it came to a close. The passionate warmth of the string section returned in the second movement, interwoven with beautiful well-balanced wind and brass. The piano dance motif in the final movement transported us to a Norwegian folk evening and the the energy of Simon’s playing was expertly picked up by the young musicians under Paul Cox’s baton, delicately intertwined with pretty woodwind interludes. I, and others around me, were simply spellbound as the work drew to a triumphant close. Additional amateur musicians (mainly from Reading’s innovative Aldworth Philharmonic Orchestra) drafted in for the evening helped lend the Beethoven the gravitas and majesty it deserved. The dramatic tension developed in the first movement contrasted magically with the expressive and delicate playing of the two central movements and some highly effective and united ensemble playing led to a joyful end. The audience left warmed to the heart despite the cold winter weather, buzzing from an evening of dramatic yet sensitive playing, made all the more remarkable given the juvenile average age of the performers. If you missed this concert there are plenty of opportunities to support or get involved with local musical ensembles featuring some of the evenings players. Reading Youth Orchestra are currently looking for young players grade five and above. Their string section play Holst St Paul’s Suite with University of Reading Symphony Orchestra in the Great Hall on 4th June. Aldworth Philharmonic play 21st May at the Reading Concert Hall, and Simon Crawford-Phillips regularly plays London concerts including with the Kungsbacka Piano Trio – next concerts are at Wigmore Hall on 16th and 17th April. Don’t deny yourself a rare treat – support our Reading musicians, both youthful and more mature.